The French Biscayne trade axes are the oldest style of metal axe we know of traded in North America. 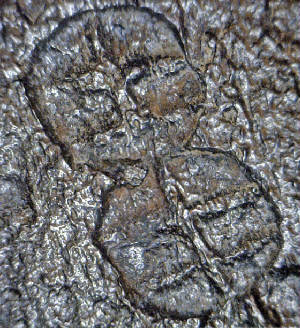 The eye pattern has a distinctive ovate egg shape that contrasts considerably with typical round eyes usually found, although some round eyed axes with the same touch marks as other Biscayne axes do occasionally show up to confuse us further which are probably from the 1700's (See La Belle shipwreck 1687). Records show Biscay hatchets being traded to American Indians by the Spanish as early as 1520's - 1540's; the French from about 1560-1750's; and the British from 1674 -1690's? which were copies of the French ones but were recorded as imports by the blacksmith Samuel Banner from England. The terminology and history of Biscay hatchets in the fur trade are not completely understood because there are so many places surrounding Biscay Bay where other provinces and districts also named Biscay in NW France & SW Spain make it difficult to track. Surviving records are unclear. Even the spelling of the adjective 'Biscaine' or 'Biscayne' varies from source to source. 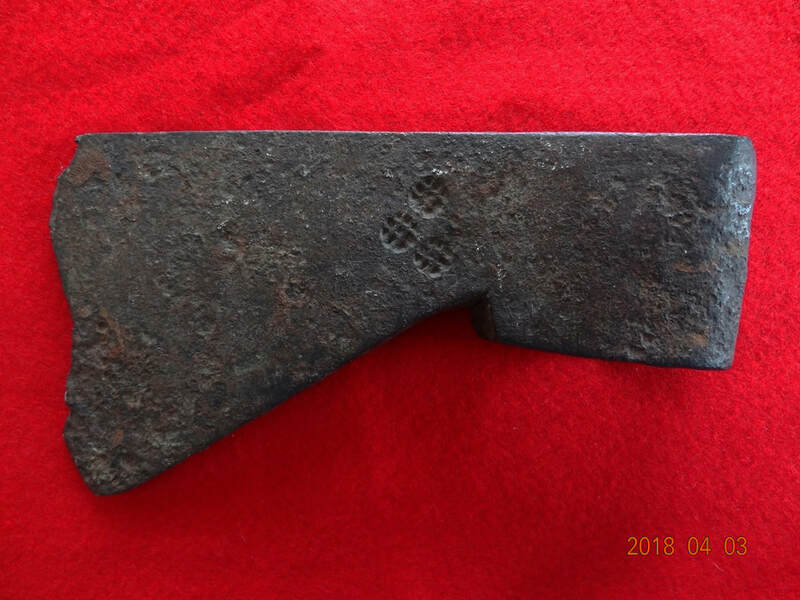 The Spanish call them "Viscayan" axes and at least one source claims they were made initially by the Viscayans in Spain, however further investigation indicates at best Spain may have only supplied the iron ore for them. The Basque people were rather independent themselves and often sent whalers & fishing vessels to the St. Lawrence region to trade directly with Canadian natives from the 16th C on. Naturally many of these profit making trips were not extensively recorded. In the last decade more evidence of their trading has been uncovered. 16th C. Basque & then later the Norman traders brought them & other goods to trade along the St Lawrence river which neighboring tribes soon acquired from inter-tribal trade. The Normans seemed to prefer the smaller axes less than 1.5 kg from the 1600-1620 period. The Hudson's Bay Company began literally copying the French biscay trade axes in 1674. The English of HBC even went so far as buying axes from French traders and sending them to England to be copied in "Seize, Viet of 1 1/4, 1 1/2, & 2 lb." (Rich, E. E., Ed., Minutes of the Hudson’s Bay Company 1671-1674, published by The Champlain Society, London, 1942). How long the English copied the French made axes is not known but there is no mention of it after the 1670's. Whether the English also copied the Biscay smith marks also is unknown and we have no evidence of it, however it would make sense if they did. Indians were satisfied with those type axes so would be wary of anything different. There are 32 different known markings made by French blacksmiths on these Biscayne trade axes. The number of trademarks on one side of the blade have been postulated to indicate the weight. i.e. 2 marks indicate 2 pounds of weight and while it seems to hold true for most I have seen occasional exceptions to this rule. 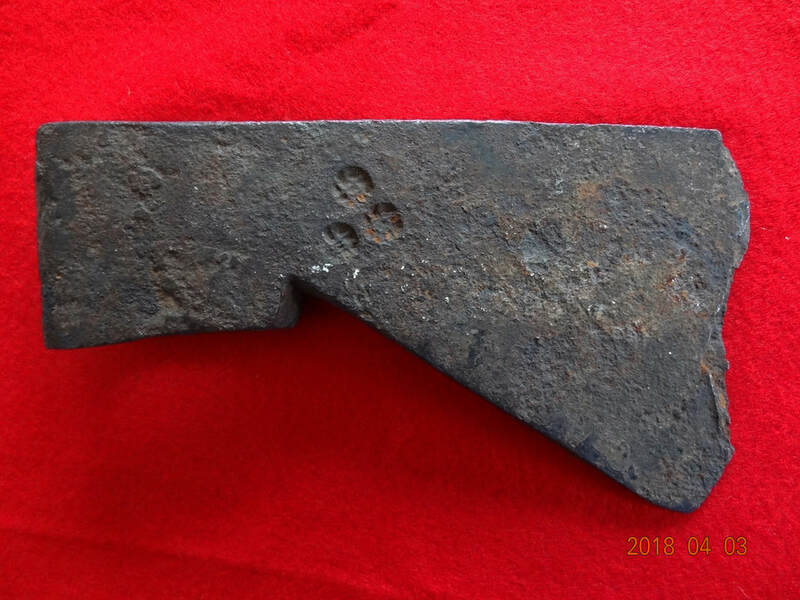 As many as 32 different blacksmith's marks have been attributed to the Biscayne Trade Axes although they probably have no meaning to any particular blacksmith. 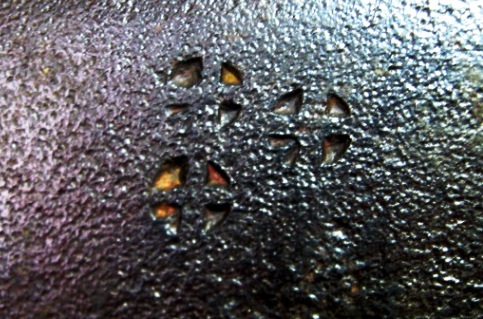 Recent research indicates these were more or less used by those blacksmith shops in Bayonne, France with or in Quebec with no more specific meaning other than indicating weight (1 lb = the number of marks on one side). At one time prior to this they may have had some greater significance but many appear to be symbolic of Christianity, such as the crosses in circles, or Lorraine crosses, etc. Interestingly none of the known Biscayne axes were unmarked. Some old Spanish axes recently shipped over are very similar to these but unmarked. 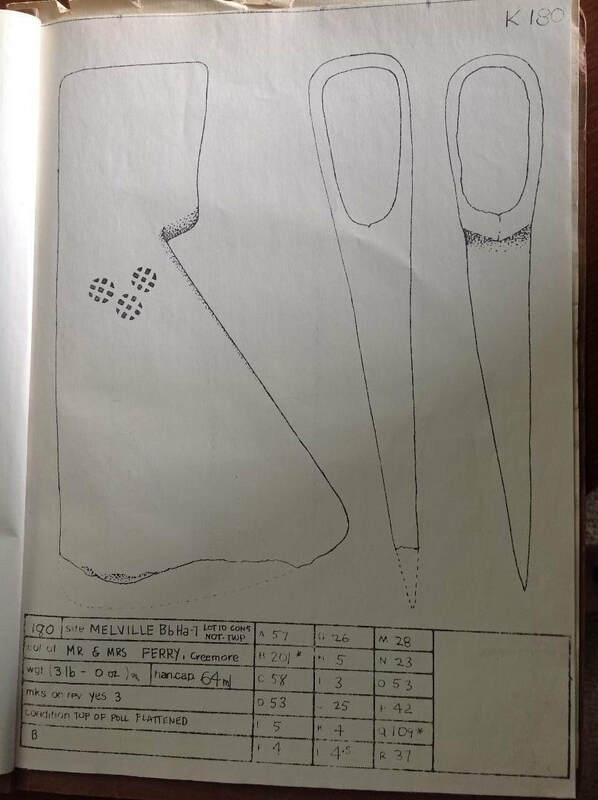 Using Russel Bouchard's dating method in the book Les Armes de Traite this particular axe would date between 1608-1760 (Form A), however its slight downward curve of the blade indicates Form C but with a different eye altogether. Bouchard's dating system is based only on those axes found at Sagunay, Quebec although his methodology is vague. There are variations which do not fit any of his categories entirely so they probably should be best viewed with a skeptical eye at this point. This particular mark has not been recorded before and no doubt there are more new ones yet to be found. It measures 7.25" x 3.5" & weighs 2 lbs 9 oz. Studies in Ontario and Great Lakes regional Biscayne trade axes indicate the 1580-1600 period had a more wedge shaped appearance overall, while they tended to get thinner and more concave into the 17th C.
This mark with the circle divided into 5 pie pieces was found in a Seneca Village near Rochester, NY. 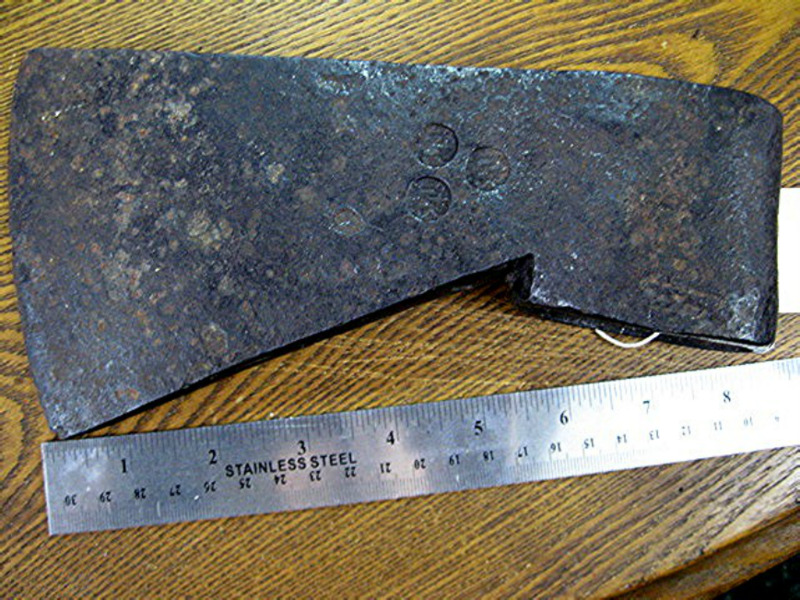 There are about 32 different marks that are found on Biscay hatchets. 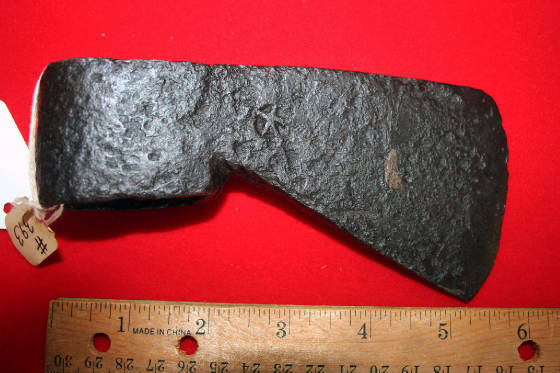 This cross within a circle mark on a biscayne axe is from the French and associated with the Jesuits and has been found as early as 1575 in the Cameron site (Oneida tribe) in New York which dates from 1575-1590. It has been found as late as 1670 on other Oneida sites. 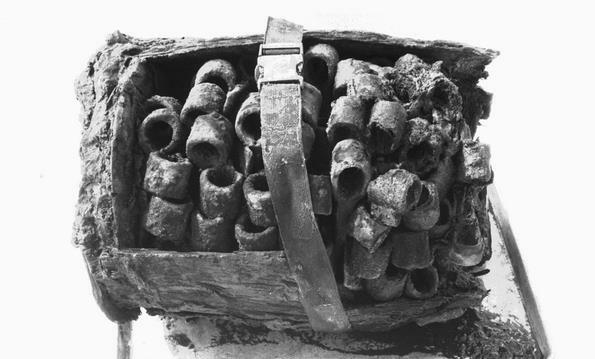 (See Wampum War & Trade Goods by Gilbert Hagerty). Kenneth Kidd found 4 variations of this mark in his study of Saint Marie axes which seemed only to vary in the dimension of the mark. So it appears we are safe to assume this mark was made at least between 1575-1670. These also are found in the Neutral tribes area of the Great Lakes in southern Ontario to NY & Ohio. The haft on this one is a recent replacement that came from another old handle. BEWARE OF FAKES WITH CROSS IN CIRCLE MARKS! THE AXES LOOK NOTHING LIKE THE ORIGINALS & ONE WAS RECENTLY SEEN ON A DOUBLE BLADED HATCHET--OBVIOUSLY NOT BISCAYNE BUT THEY TRY. 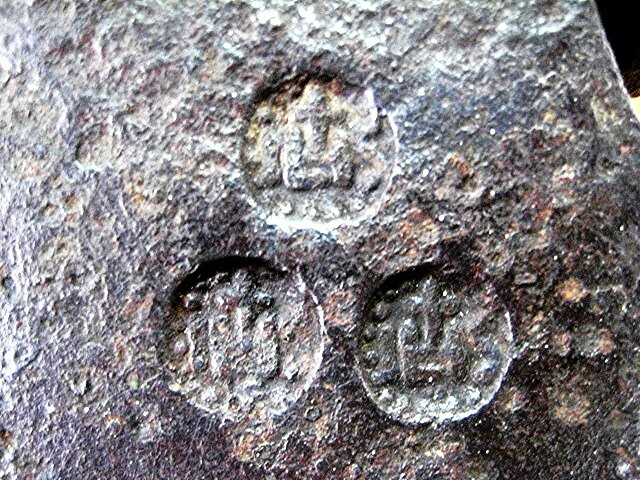 THE LOWER LEFT QUARTER HAS A SLIGHT WEDGE IN IT WHICH APPEARS TO BE A VARIATION OF THIS MARK. Notice the flaw in the lower left quadrangle of the mark indicating the blacksmith's punch had been damaged. Normally that cross in a circle mark does not have that particular flaw in it...or was it made deliberately? Comparing this one with the one on the right shows that one also has narrower branches than the other. I'm sure there was more than one die to make these marks, but the variations perhaps can be clues to dating these with the proper archaeological research. This is the oldest trade axe I own from about the 1580-1599 period. 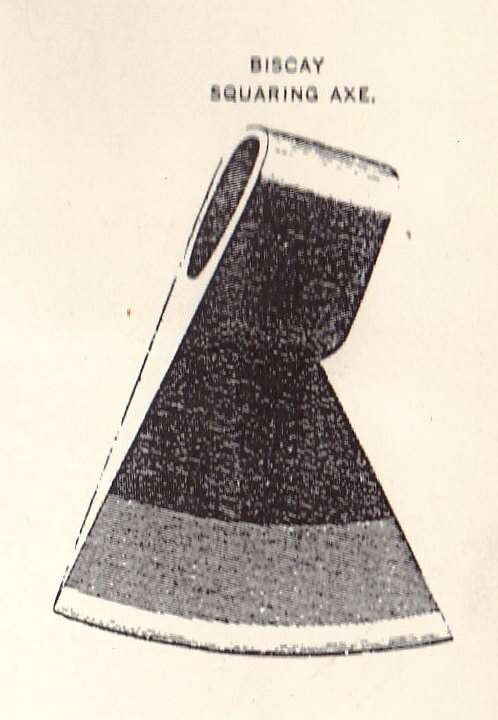 Another French Biscayne style axe associated with the Jesuits with a different cartouche. This is large, heavy and thick wedge shaped which indicates it dates prior to 1600. After 1600 the blades became increasingly thinner, smaller and more concave on the blade faces. At first glance it appears to be just a jumble of hash marks in a circle but it must have meant something since this exact same mark has been reported on other Biscayne axes. They were all used among the Neutral tribes, Hurons and Micmacs of the Great Lakes area Eastward. They came in 1, 2, or 3 lb sizes and were built much more robust that the later ones. Biscay Bay is the location of a Spanish iron ore mine which the French had used to obtain their best iron ore at this time. One of my all time favorites is this French made Biscay Bay trade axe with a IHS & cross above it symbol on it. It has a steeled edge, measures 8.5" long x 4.6" wide and weighs 4.0 lbs and was found by St. Ignace, MI. Circa 1650. Although the symbol IHS had been found inscribed on early Christian burials, the original meaning was lost to time & left to later interpretations. In 1541 the Roman Catholic Jesuit priests of France, Order of St. Ignatius of Loyalia, chose that monogram with a glowing sun around it as their seal of the Society of Jesus & St. Ignatius as their first "general". The French pronounced St. Ignatius is St. Ignace, thus the name of the city in Michigan & their mission. The stars around the monogram on this particular axe were no doubt meant to signify the radiant rays of sunlight around the symbol. 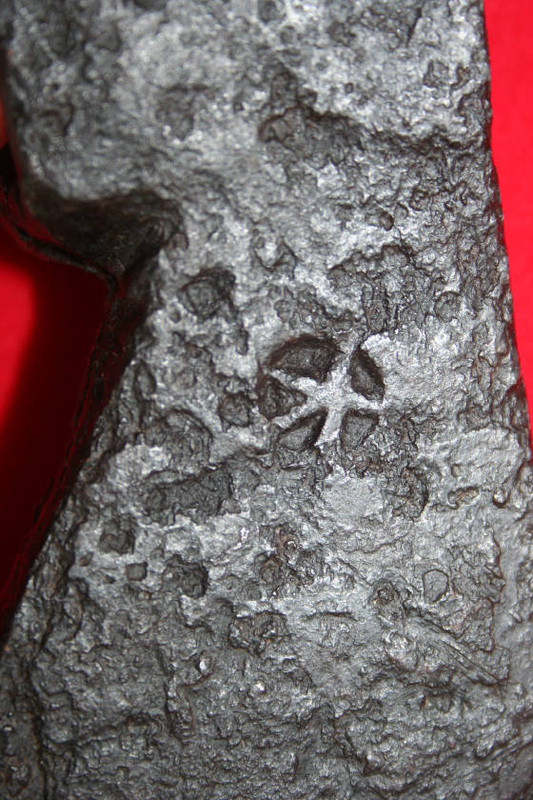 In fact most of the Biscay Bay type trade axe marks can be traced to early Christian symbols or religious symbols such as the cross with a circle or radiant type symbols. The Jesuits traded these to the Indians among others for food & other needs. They also offered these as prizes to those Indian students who had memorized certain bible passages or accomplished religious training levels. This symbol is found illustrated frequently in various forms among the papers of 'The Jesuit Relations and Allied Documents & Travels and Explorations of the Jesuit Missionaries in New France - 1610-1791'. The English interpretation of the mark was 'In His Service' as a sort of plagiarism of the In His Majesties Service" marks found on English ware of the same time. 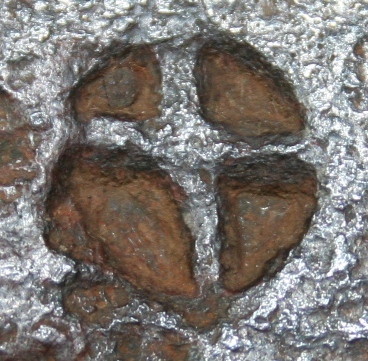 This mark is seen on Jesuit trade rings found on Indian sites as well, both with and without the cross. It is shown in the book 'Les Armes Des Traite' by Russel Bouchard & is dated 1608-1760 in that source. 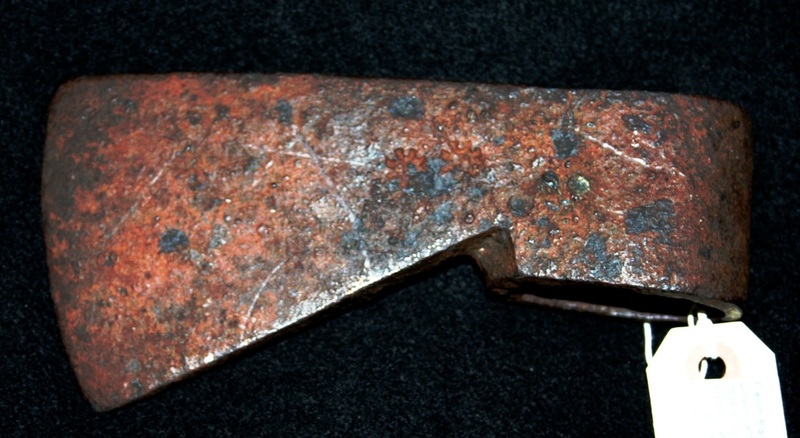 Based on it's location of discovery, Ft. De Buade/ St. Ignace, this particular axe probably would date between 1671-1705 when the St. Ignace mission in the straights of Michigan was formed and abandoned. This is an unusual example in that it was documented & can be traced to a particular Indian site which Champlain visited in 1616 & the site was abandoned shortly thereafter. FOUND IN 1976 ON PRIVATE PROPERTY AT THE MELVILLE SITE (Bb-Ha-7), IN CREEMORE, ONTARIO. SAMUEL DE CHAMPLAIN WAS THE FIRST EUROPEAN CONTACT WITH THE PETUN NATION WHICH HE CAREFULLY RECORDED, TRADING BEADS, AXES AND OTHER ITEMS AT THE TIME OF HIS VISIT. (photos courtesy of Brian Rollason). 1687 French shipwreck La Belle near Gulf of Mexico shows Biscayne trade axes with round eyes instead of oblong in a wooden barrel. The image below is from the 1864 Sheffield Standardlist Illustrated catalog describing a 'biscay squaring hachet' pattern. Although it has little in common with earlier forms, the name Biscay still promoted the idea of quality that their North American customers were accustomed to. Notice the eye still has the oblong egg shaped eye. I just heard from Kevin Gladysz that he had written the first of a two part article on Biscayan axes which is being featured in the August/September 2012 issue of the “Journal of the Early Americas”. This may be of great interest to some of you who own one or hope to. See: http://puffin.creighton.edu/jesuit/relations/ for more information about the Jesuits in North America. "Before Albany; An Archaeology of Native-Dutch Relations in the Capitol Region 1600-1664"